Willians Astudillo is a man of many talents. Now he can add "hidden-ball trick artist" to that list. The Twins prospect hoodwinked Dawel Lugo with the hidden-ball trick at third base in the third inning of Triple-A Rochester's 6-4 win over Toledo on Wednesday at Frontier Field. It marked the second time the Red Wings pulled off the feat this season after Jermaine Curtis faked out Charlotte's Kevan Smith on April 17. After Tigers No. 6 prospect Christin Stewart worked a walk and Lugo laced a double to open the top of the third inning, Mikie Mahtook looped a sacrifice fly to right field, scoring Stewart from third and advancing Lugo to third. But once Astudillo scooped up the throw to third, he hung on to it and didn't throw back to pitcher Chase De Jong. He waited until Lugo stepped off the bag and swiftly tagged him out for the second out of the inning. "Every time in a situation like that, we like that we look for a play that can help us get out of the inning," Astudillo said through interpreter and Red Wings shortstop Gregorio Petit, who tossed the ball to the third baseman after receiving the cutoff to set the play in motion. "As soon as I got the ball, I looked at the third-base coach [Toledo skipper Doug Mientkiewicz] and the runner, and they were looking different ways. Petit was the only one who knew that I had the ball in the glove, and then the pitcher, and it worked. It worked the whole time." De Jong didn't pick up the plan at first, but once he did, he was elated to see it executed successfully. "Then I'm just trying to do my best salesman pitch. Walk to the mound, put my glove underneath my arm acting like I got it. Go over and clean my spikes, grab the rosin [bag]. ... Sure enough, I get behind the mound and I'm straddling the rubber and I see Lugo come off the bag and [Astudillo make the tag]. The umpire [Adam Beck], I don't know if he thought he was joking or what, but once he made the tag and saw he had the ball, he called him out and I was ecstatic. ... I think this was my seventh season in pro ball and I've never done it before. That was really cool. And at that point in the game, the score wasn't as close and that became a pivotal out." 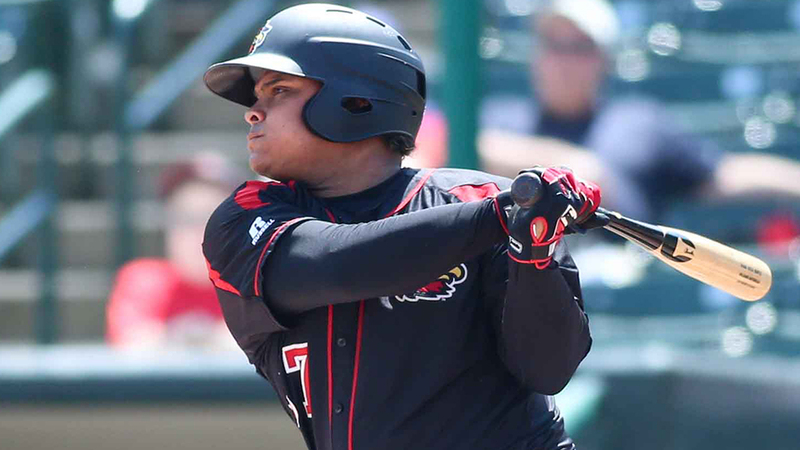 After De Jong limited the damage by fanning Chad Huffman for the final out, Rochester erased a 4-0 deficit after Jeremy Hazelbaker and Tyler Austin tallied RBI singles and Astudillo lifted a sacrifice fly in the fifth and Kennys Vargas walloped a go-ahead two-run homer in the seventh. Astudillo, 26, made his big league debut this season with the Twins in seven games in a utility role. The Venezuela native hit .263/.263/.368 in 19 plate appearances and played six different positions -- second, third, center, designated hitter, left field and pitcher -- in the Majors. He's caught 33 games in the International League this season. "I was excited," Astudillo said of his first stint in the Majors. "I was happy that I earned that shot, I think it went good and I'm just working hard to earn another chance up there." The 5-foot-9 jack-of-all-trades possesses terrific control through the zone with a 4.8 percent strikeout rate, the lowest of all qualified hitters in the Minors, according to FanGraphs. Twins No. 3 prospect Nick Gordon went 3-for-4 with two runs scored and an RBI to pace the Red Wings. Lugo roped two doubles for the Mud Hens.